In an unassuming building on the west side of Mt. Pleasant, the William and Jan Strickler Non-Profit Center is changing the way service organizations in Isabella County combat poverty in their community. According to Mt. Pleasant Area Community Foundation Executive Director Amanda Schafer, the center as it exists today is just the beginning though. Schafer and her team at the foundation have been integral to getting the center off the ground, raising roughly ninety percent of their initial million dollar goal so far. “With one million we can buy the building,” says Schafer, “but there will always be on-going need.” Even so, Schafer insists the money is the easiest part. The heart of the center’s very mission poses the bigger challenge. Home to four different organizations right now, the center was founded with a goal of bringing the community’s existing service organizations under one roof and adding new services and resources to the mix. Schafer says that while there are a lot of moving parts when you bring independent organizations under one roof together, the arrangement benefits everyone. The people who come in for assistance can combine appointments, saving precious time and resources on transportation and even learn of other resources they may not have been aware of while there. Meanwhile, the organizations themselves gain a community of like-minded groups and an affordable, accessible place to do their work. Each organization in the center leases space at about one-third the market rate. Since most previously operated out of church basements or the trailer of a semi-truck just having that stable location for people to find them has revolutionized the way they’re able to operate. One of the organizations in the center, Clothing INC, has experienced such an uptick in demand their appointment backlog stretches two months out. A donation-based community closet, Clothing INC offers gently used clothing, shoes, and accessories at zero cost to people in need. Anyone can make an appointment to shop the closet. Once there, a volunteer helps select items ranging from socks and shirts to belts and coats, checking off the organization’s checklist as they go. Each family or individual is welcome to shop three times per year, or about once every four months, as the seasons change. According to Bryan Chapman, Director of Operations, they’ve handed out more than 85,000 items of clothing since moving to the center a year ago. In the next room, The Care Store, a community cupboard that offers personal and home care items that people in need often cannot access anywhere else, has also seen an increase in demand since moving the center. Director Kim McBryde says that basic hygiene needs are often overlooked in other safety net programs. Bridge card holders often can’t use their assistance to purchase things like shampoo and laundry soap so when those items run out, they sometimes suffer without necessary supplies that are needed every day. “We care a lot about dignity here,” says McBryde. The Care Store runs on “care bucks.” In addition to walk-in requests that McBryde and her team will fulfill on the spot, people who are on state-run assistance programs can be referred by their caseworkers and given a care bucks stipend according to their situation. McBryde says most referrals are for twenty-five or fifty dollars worth of items ranging from soap to trash bags to feminine care products. Each shopper is warmly welcomed into the store and the door to the main reception area is closed for privacy as they select the items they need from shelves set-up to mimic a small boutique. In fact, it’s hard to visit the Strickler Non-Profit Center and not notice how much dignity and respect is emphasized throughout. Just inside the front door, a volunteer receptionist greets each person as they enter and assists with registrations and appointments. Behind the desk lies an area that echoes the comforts of home. Welcoming sofas and chairs flank a large, stone fireplace in the center of the room. One of the center’s namesakes, Jan Strickler, says this was all by design and one of the most important features of the center. “The people who come here for help are our guests,” she explained. And that’s a philosophy everyone at the center has clearly taken to heart. In addition to Clothing INC and The Care Store, the center houses both the Community Compassion Network Pantry, a previously mobile food pantry; and the Isabella County Restoration House’s new day shelter. While mobile, the CCN Pantry served more than 6,500 families per year out of the back of a semi truck. 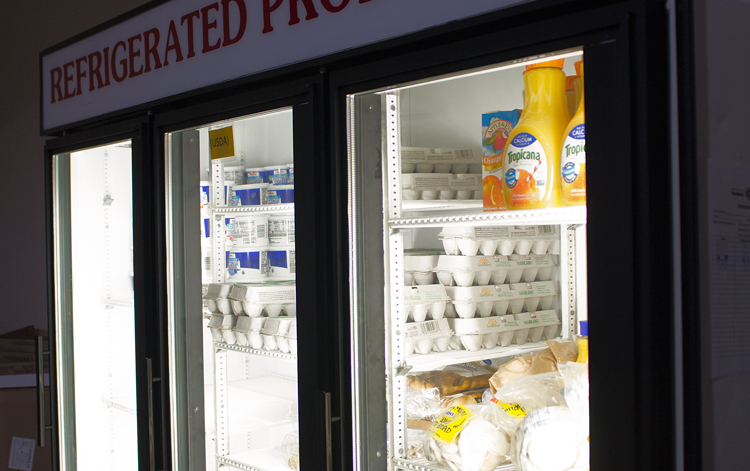 For them, moving to the center means more space for storing cold and frozen foods as well as more frequent and accessible hours. Instead of offering food just twice a month during limited hours that may conflict with work and transportation schedules, the pantry is now open every Wednesday morning, Thursday afternoon, and two Saturdays per month. The ICRH day shelter also extends service hours to an especially vulnerable population. A rotating nighttime shelter run by thirty-one different community organizations, ICRH provided 3,025 overnight stays and more than 3,000 meals to 153 individuals last year. By partnering with the Strickler Non-Profit Center to open a day shelter during the coldest months of the year, ICRH will be able to help homeless citizens keep safe and warm for more hours each day. Beginning October 28, anyone seeking shelter can come to the center any time between 1 pm and 6 pm each day. In the evening, transportation is provided to the rotating shelter location for that night. Everyone at the center embodied this philosophy. Every little victory for the center’s guests are a victory for the organizations and their volunteers as well. “When one of the people who come in for the shelter get their own place, we all celebrate,” says McBryde, “we turn up the music and take them on a shopping spree to stock their cupboards at their new home.” Many guests even come back once they’re on their feet and sign up as volunteers themselves. To learn more about the center or make a contribution, visit the Mt. Pleasant ACF.